The rainy season has not come this year as usual. Some districts around us are getting occasional showers that we hope will sustain their crops but Kisongo is not getting even that. We request your prayers for the farmers whose crops still have a chance. Even if it started raining now the majority of our crop, if not all, would be lost but we hope that is not the case for the other farmers. While this news sounds terrible – we have two years worth of corn stored from past harvests. But pray for those whose livelihoods depend on this rain and these crops. The school will be fine, it is just a setback, but many others desperately need this rain and these crops to feed their families. We continue to harvest greens, onions, and other small crops on our raised drip beds. We are grateful for this technology that allows us to conserve water and still harvest. Because our corn is a loss this year we will not be able to use the stalks for silage for the cows. But also, because there is no rain, grass is scarce even on our farm. Because of this we went ahead and bought 400 bales of hay before prices go up due to the drought. 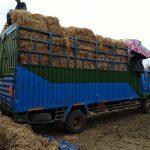 This is the first year since we moved to Kisongo that we have had to buy more than just a few bales where we ran out of silage a few weeks early. It was not included in our last report but for the last month Anna has been visiting many women in our churches who are suffering for different reasons. Pray for our churches and pray for those who satan is trying to break them by others attacking them, attacking their marriages, their crops dying and not being able to feed their families and so many more reasons. It has been a difficult month but we know it is one of the reasons we are here. Despite the losses that continue to come we teach that God is still good and our hope is not in these things. I am preparing and teaching a course on Christian evidences at ACSOP. Please pray for rain. We need it for the crops but also to refill the water table that feeds most of the wells. And, as many of you know, power is ran on hydro-electric here. We need rain for many many reasons. We are grateful to our Tanzanian family who is one by one in their own ways celebrating our last 3 years here and saying their goodbyes. This last week we went to the home of Bomoa for dinner. We have not seen more spiritual growth or maturity from anyone since 2015 as him and his family. It has been an incredible journey to watch and we are grateful to have played a small part. If you don’t get their reports know that our teammates, Philip and Bekah Duncan, are a great fit here. 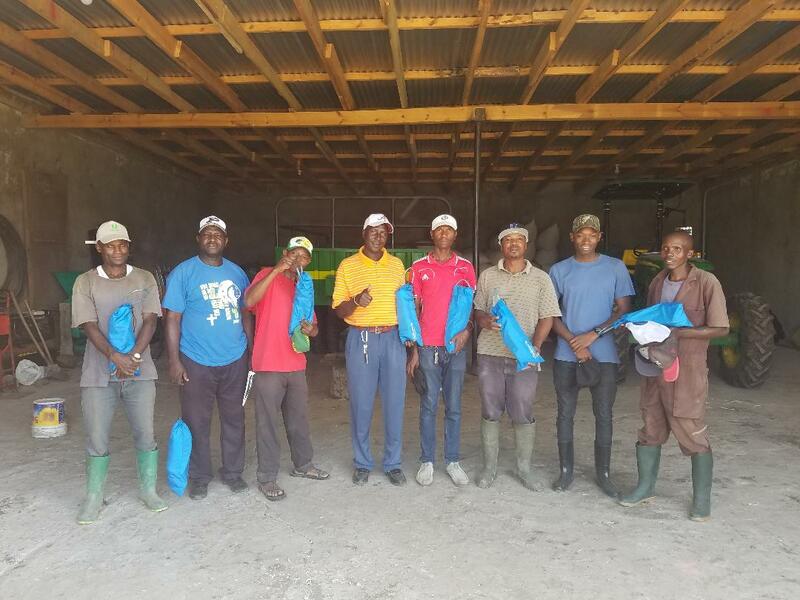 Philip has helped tremendously with the farms budget but more importantly he has dedicated his time and effort to the teens at Kisongo. This last Sunday, it was awesome to see so many of our teens home from boarding school. But it was even more awesome for them to have a class, led by Philip and Rodrick, to help grow them spiritually. We hope that more churches take the time to begin teaching and training their teens in the Lord. On Sunday it was announced at Kisongo that the church at Mto wa Mbu is in the processes of installing elders. We were thrilled to hear this! It is so great to see more and more churches choosing the biblical model of leadership. Keep this church and their possible new elders in your prayers. The first week of March we were blessed to have Don Hendricks and his son, Corey, with us. 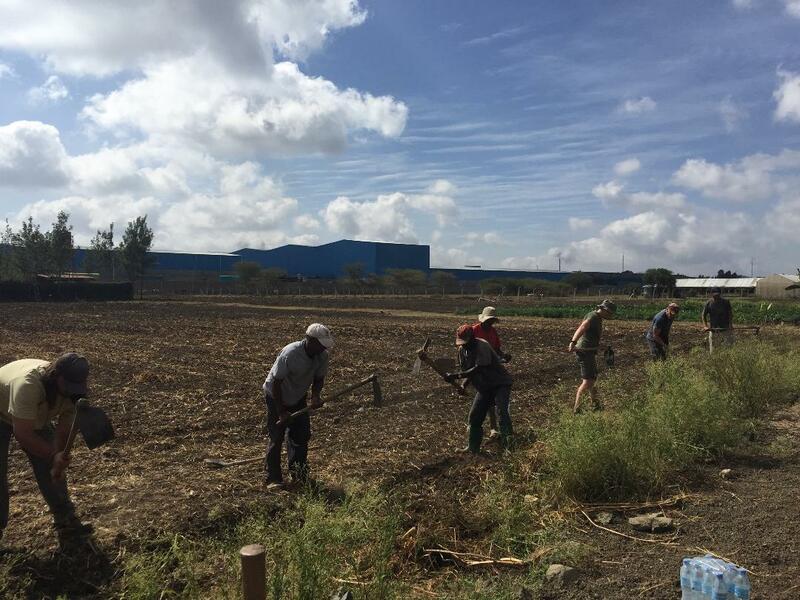 They climbed Kilimanjaro and then came to us to help on the farm. We are grateful to them for their hard work. Sometimes farm work isn’t glamorous, just hard, and they didn’t complain as we dug ditches for several more days. We finally have trenches that run the length of the farm. We have also redone all of the raised beds to prepare for the rainy season. With that being said, we have only had a couple of small rains since the crops were planted. However the corn, beans, and sunflowers are all out of the ground. It has rained all around us but not in Kisongo this past week. So please pray that we soon begin receiving rain. The farm continues to run well as we are still ironing out all of the last minute details for our summer departure. We know that even after we leave there will be things we did not anticipate so please be praying for all of those things and the transition for our friends and fellow workers. Now that we are back our routine is finally back to “normal”. Anna continues to teach her children’s classes at the daycare and local school every week. She is also back in the routine of follow-up studies and new evangelism studies with members of our Kisongo church. This month the women of the local congregations met on the first Saturday for Bible study. This is something they do every month. They asked Anna to teach on Obadiah and for her to teach on Malachi next month. Two Tanzanian women also taught and gave wonderful lessons. We are also slowly visiting our Tanzanian brethren house to house as we say our goodbyes over the next few months. This is so hard on us and them and please pray for this process as everyone grieves and accepts change. We have reached the point of trying to make every aspect of our farm sustainable in itself. This year we have reassessed each project and improved it. I have also turned over the managing position to Agustine. I am here, of course, to help when he needs advice but I am thrilled to say that this is going well. showers (uncommon this time of year). We spent the first week cutting the corn and then shucking. 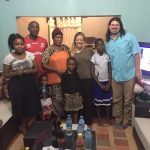 We had help from Kendyll Covington and the Duncan family (only 12 hours after arriving to TZ!) As we went through the crop it was quite discouraging. The corn was much smaller this year and unlike last year we only had one cob per stalk, two were very rare. However, God always shows us that He is in charge and He can make something out of nothing. We planted half of what we did last year in corn. If you remember we had hoped to have beans but all but a few bags were washed out. Despite all of this we harvested 27 bags of corn! Last year we harvested 85 bags on double the land. While this is still less than the approx 40 we should have gotten we feel like this is more than we could have wished for given the growing circumstances. Agustine while shucking next to Anna said, “This year is all extra. It’s okay it did not do as well. God is good.” He gave us a much needed reminder and we are grateful for that and give God the glory. Counting the new bags we have 88 bags in storage for the school. We hope to start the final phase here which Philip Duncan will help us with. The last part of sustainability is budgeting. Please pray as we begin this next phase. 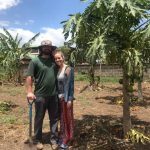 We have worked some on this in the last three years but this year Philip will play a huge roll in being able to turn every aspect of the farm over to the Tanzanians. 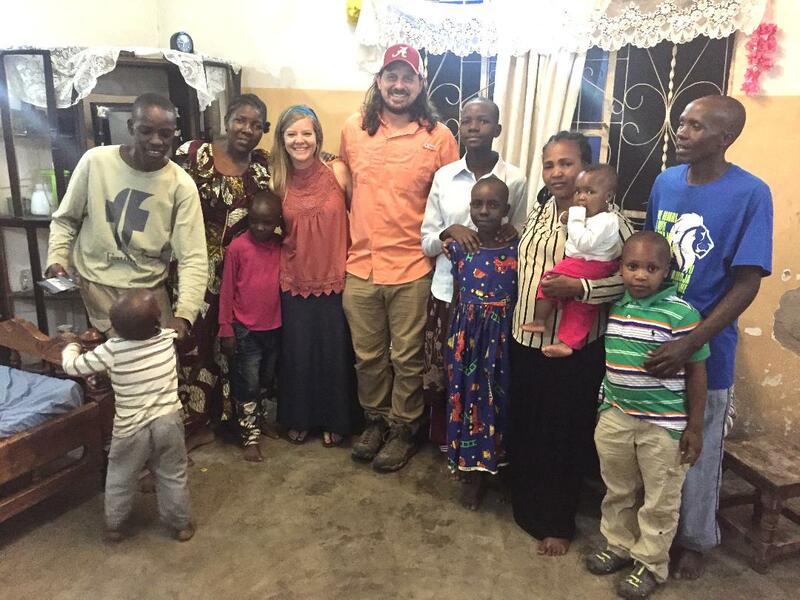 Anna was asked to travel to a new(er) church outside Karatu and teach their women about how to serve in the church. Bekah Duncan, only 3 days after arriving, offered to go with Anna. Together they spent the day with the women at Endamarariek talking about the 3 reasons we often give for not serving and how to serve despite these 3 things. The women were very engaging and the local preachers have asked if they could come and do the same thing for the other Karatu churches. We are praying that if the Lord wills they can go and help mature these other churches. I have been invited to a second church in Dar es Salem to give lessons on leadership. The church heard of our work at the Temeke church last month and asked if I could come and help give lessons on elder to elder relationships, elders to deacons, and elders and deacons to member relationships. Please be praying for this effort and if the Lord wills that we can travel to Dar again in the upcoming months. Please keep the Duncan family in your prayers. They moved here on August 8th and have been pitching in from day 1. We are waiting to sign a contract on a house for them to rent so please pray that works out and goes smoothly. We will be ordering tickets for furlough soon. We will update you all in the next report about when and work out coming to all of you. Thank you for your continued efforts in this work. The farm is doing well and we give thanks to God. We currently have two rooms of broiler chicks growing out at different stages and are preparing to add a third room of baby chicks soon. The school and Anna and I are grateful as chicken is hard to come by lately due to supplier and boarder issues. We have spent the last few weeks cleaning and preparing and replanting the raised beds. Next week the students return from their break and food will be ready for them. Harvest season is just around the corner. It has taken much longer this year for things to dry out but we will be very busy harvesting our corn in the next few weeks. On a personal level – we were gifted rabbits as a thank you a few months ago. We are now bursting at the seams with baby rabbits. Anna and I are grateful, if you know us you know we loved raising meat rabbits in the States. Hopefully, this will help us since chicken is sometimes not available lately. This month we had 3 guests from Tennessee come and help us with post-campaign work. We are grateful to them for their efforts. Many new Christians have been visited and encouraged and more souls have been added to the Lord’s church. The Kisongo church is working hard to finish their building and we are so happy for them. They are also working hard with many classes to provide spiritual nourishment to all ages at the church and the new converts. On Sunday morning there are now six different classes for the church and we are happy to see them trying to encourage and mature one another. Anna continues to teach two bible classes a week to different children (day care and local public school). She is also going out one day a week to evangelize and one day a week to encourage and strengthen our women in the church through Bible study. Denton Landon from North Carolina is here teaching two Master’s courses at ACSOP. I am grateful to be able to take these classes and have been encouraged to see how well they have been received by the local brethren. August 8th the Duncan family will be moving to Tanzania to join the TZ2000 team. Please keep Philip, Bekah, Micah, and Nathan in your prayers as they transition to the work here. We are happy to have them and pray the Lord’s Kingdom grows. We are excited to share with all of you what has been going on for the month of June. We apologize for only sending out one report this month but with everything going on here the date to send out a report slipped by us. This month the campaign “Safari for Souls” continued in the Kisongo area. The Hoover church of Christ from Alabama and the Son Valley church of Christ from Arizona both sent groups. Within these groups there were individuals from several other congregations. With all of the evangelism over the last month 68 souls have been added to the Lord’s church. We are unbelievably grateful for this. 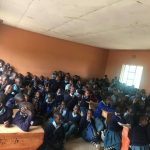 Now the Kisongo church is working to encourage and teach these new souls. 3 members from the Hoover church stayed behind and helped us and locals conduct new convert studies. A husband and wife, Jeff and Shawna Wiant, from the Bear Valley church of Christ have also come in and helped continue evangelism and encourage and teach our new converts. We ask for your prayers for the Kisongo church of Christ. This is a lot of new members and a lot of work spread among very few people. Please pray we can work hard to retain these new converts! The Kisongo church of Christ also continues to work on their new building. Keep this effort in your prayers as they desperately need a larger building (great problem to have). We are also grateful to the Norman’s and Brad Whinery and the work their group from Oklahoma have come in and done on the other side of town. 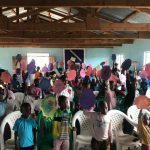 They have held evangelism, VBS, and seminars for the last week in the Maji ya Chai area. Many souls have come to be added to the church and we pray for their steadfastness in what they have learned. This month we also held a children’s seminar at the Arusha church of Christ. 120 kids showed up and were taught by Anna, Shawna Wiant and Kendyll Covington. Leah Covington and Tiffany Roberts taught the women of the church and some visitors wanting to hear the gospel. Jeff and I went and shared the gospel with some people near the church. Keep these efforts in your prayers. Anna and I will, Lord willing, be traveling to conduct a leadership/eldership seminar at a church in Dar es Salem in July. Please keep this effort in your prayers as well as safety in our travels. Thank you to everyone who reached out to us about our house flooding. We are happy to report that we incurred very very minimal damage. We are grateful to the Hoover and Son Valley groups for lending a huge hand in the cleanup. Thank you to Rossville Church of Christ for donating the money for the farm to purchase two chainsaws. We hate we did not video the farm guys’ reactions to seeing a chainsaw for the first time. One of the men, Jemsi, spent the entire day saying “thank you, thank you” because he was overwhelmed with gratefulness by this gift that makes everyone’s work easier. Because of this new gift we were able to cut more than $1500 in firewood in four days. This firewood will be used for the school’s cooking and for the Kisongo church’s campaign cooking this year. Thank you all for this great and much needed gift. Thank you also to Mason Hinote from Central Church of Christ in Augusta, Georgia. Mason is ten years old and worked to raise the money for his plane ticket to Tanzania to work with Safari for Souls. But, he did not stop at the plane ticket. Mason worked until he had raised enough money to buy the farm a new bull. We are all so grateful and the farm guys were so impressed that he had worked and thought of them and their needs. Mason named the bull “Big Joe” after his friend and mine and Anna’s brother-in-law Joe Burns. Safari for Souls began this week at Kisongo church of Christ. The week before the Kisongo congregation went out and set-up 75 studies. Central church of Christ in Augusta, Georgia came to kick-off this campaign. They worked together with the members of Kisongo and the work has been received so well by both the church and the community. In the morning everyone went out into the community and conducted evangelism and in the afternoons an elder from the Central church, Ben Lambright, conducted a seminar for the members on elders. While the seminar was going on, Jeremy Hinote and Bobby Pace alternated teaching a new convert class every afternoon. In five days the 9 members of Central church, the Kisongo church, the Storks family, the Norman family, and Anna and I helped lead 32 souls to Christ! This morning 17 of those new converts came to class and church services. Some of the new converts work at A-Z factory and work on Sunday’s. The others we are visiting this week to encourage. We are grateful to everyone who has been involved in this campaign. The church has grown, it has been encouraged, and all the glory goes to God. Thank you all for your hard work and prayers. Next week we, along with Kisongo, will set-up more studies and go back to encourage our new bothers and sisters. Please pray for all of the people coming to continue the campaign and that many souls are reached and God is glorified in the efforts.